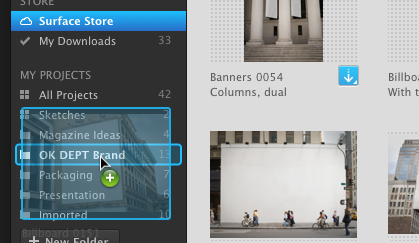 Simply drag surfaces from the Surface Store into your project folder. Context handles all of the downloading and updates so you can just work. Click your project folder and find the newly added concept surface. Roll over its thumbnail and click Edit. The surface contents will open in Adobe Illustrator. 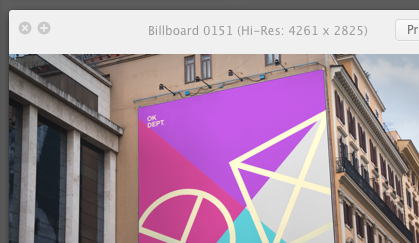 Add your artwork and images to the Illustrator artboard, positioned using the built-in guidelines layer. Click Apply Artwork from the Context Link plug-in panel. 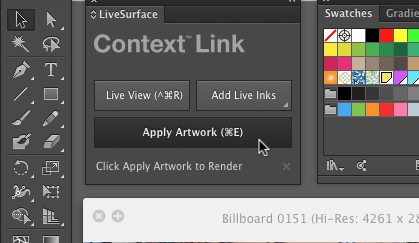 Context instantly applies your artwork to the surface and displays a preview in the Live View window, which floats over the Illustrator artboard. Context manages the downloading, updating and organizing of your surfaces for you. And you can start applying your artwork before a surfaces is done downloading, so no more waiting. Context works like a reality preview. Design in Illustrator and click Apply Artwork to see your concept rendered in real-world settings. Context does in seconds what used to take hours. Visualize photorealistic ink effects without leaving Illustrator: add inks from the Context panel and use the Live Ink swatches to fill or stroke your artwork. Adjust lighting and more by clicking Adjust. End the back and forth; stay in Illustrator. No more rebuilding layers every time there’s a change. Just hover over any concept surface and click Edit. Your previously applied artwork opens in Illustrator. With Context, there’s no need to include large redundant image files everytime you wish to collaborate. Just share the concept surface with its embedded artwork and Context does the rest. Need an exact size? Grab a Plus Surface from the Surface Store. 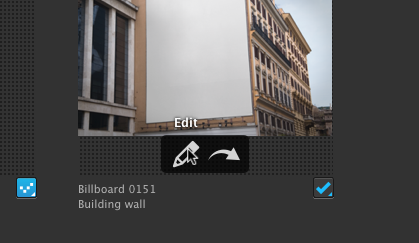 Plus surfaces can be resized or rotated in realtime so you can get exactly size and angle you need.